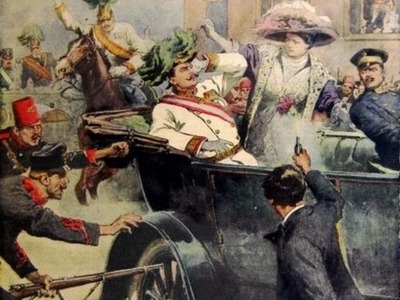 WikimediaGavrilo Princip assassinated Archduke Franz Ferdinand of Austria and his wife – which led to events that led to WWI. Global stocks are still falling on Monday, extending Friday’s steep slide following Britain’s vote to leave the European Union. According to Standard & Poor’s Dow Jones Indices, the $2.08 trillion wiped off global equity markets on Friday was the biggest daily loss ever — beating the Lehman Brothers bankruptcy during the 2008 financial crisis and the Black Monday stock market crash of 1987. Notably, this emotional response to a political shock is actually quite typical of investor (or, more broadly, human) behaviour. Geopolitical events tend to make traders and investors nervous, which then sometimes leads to volatility in financial markets. 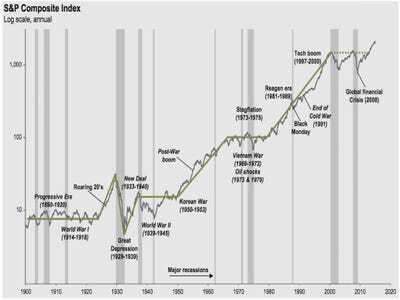 However, as history has shown time and time again, these events generally do not have a sustained impact on markets. 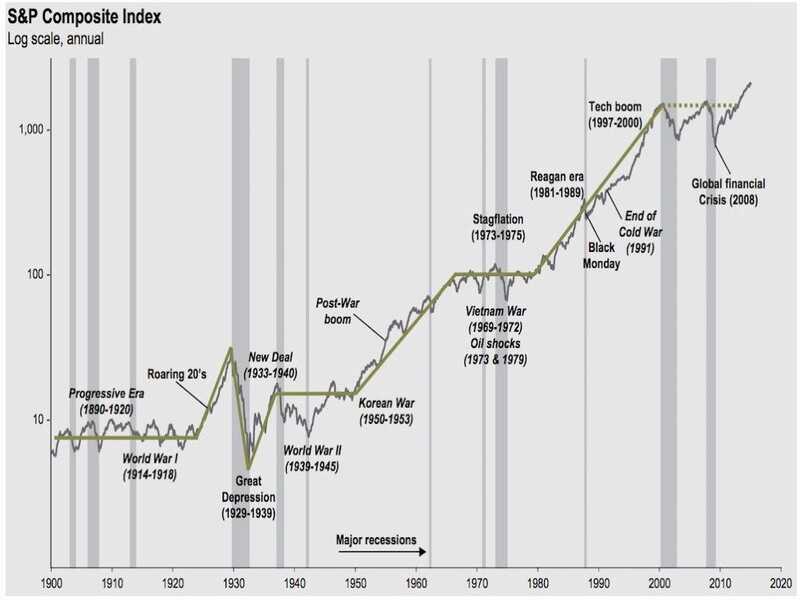 Credit Suisse’s Head of Research and Deputy Global CIO Giles Keating and his team reviewed data last June on major geopolitical events in the last 100-plus years and found that stocks generally bounced back up after these shocks. “The large majority of individual major events – ranging from the assassination of Archduke Ferdinand 100 years ago through to 9/11 and recent events in Iraq and Ukraine – impact major stock markets by around 10% or less, with the effect being fully reversed within a month or so,” he wrote in a note to clients. “This suggests that the most profitable strategy has usually been the contrarian one of buying into price falls caused by such incidents,” Keating wrote. 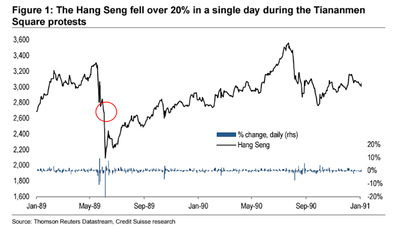 Furthermore, in light of the Brexit vote, another Credit Suisse research team led by Andrew Garthwaite recently shared a chart showing what the Hang Seng looked like in the immediate and long-term following the Tiananmen Square protests. 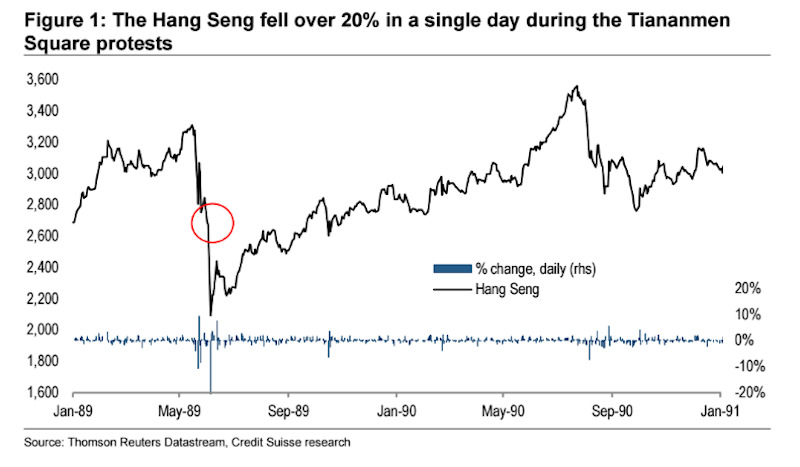 “In our experience, markets tend to over-react to political shocks, as was seen in the example of Tiananmen Square — where the Hang Seng fell 22% in a single day, losing 37% from its peak over the entirety of the protest period, before steadily recovering back to previous peak over the following year,” the team wrote. True, there have been a several times that markets didn’t recover as quickly after seismic geopolitical events such as the invasion of France in 1940 and the Yom Kippur War (which led to a complete realignment of control over global oil). But even then stocks saw recoveries within 2-3 years, as Credit Suisse’s Keating previously pointed out. As some have pointed out, the same can be said of investing. JP Morgan Asset ManagementHow Warren Buffett sees the stock market.